"Intelligence and tool-making were our strengths from the beginning. We used these talents to compensate for the paucity of the natural gifts - speed, flight, venom, burrowing, and the rest - freely distributed to other animals, so it seemed, and cruelly denied to us. From the time of the domestication of fire and the elaboration of stone tools, it was obvious that our skills could be used for evil as well as for good. But it was not until very recently that it dawned on us that even the benign use of our intelligence and our tools might - because we are not smart enough to foresee all consequences - put us at risk. Now we are everywhere on Earth. We have bases in Antarctica. We visit the ocean bottoms. Twelve of us have even walked on the Moon. There are now nearly 6 billion of us, and our numbers grow by the equivalent of the population of China every decade. We have subdued the other animals and the plants (although we have been less successful with the microbes). We have domesticated many organisms and made them do our bidding. We have become, by some standards, the dominant species on Earth. And at almost every step, we have emphasized the local over the global, the short-term over the long. We have destroyed the forests, eroded the topsoil, changed the composition of the atmosphere, depleted the protective ozone layer, tampered with the climate, poisoned the air and the waters, and made the poorest people suffer most from the deteriorating environment. We have become predators on the biosphere - full of arrogant entitlement, always taking and never giving back. And so, we are now a danger to ourselves and the other beings with whom we share the planet. " If we plot a curve of animal size against their number then most mammals sit nicely on that straight line. The fit demonstrates a match, under natural conditions, between natural resources and population size. The exception is the human species which is way off the curve, in fact our numbers are 10,000 times greater than the curve would suggest! We have become incredibly successful in terms of population compared to all other animals. This has come about because, quite simply, we are just so clever. The first breakthrough was toolmaking, then agriculture, which freed us from the hunter/gatherer limitations that still limit other species (in addition to them now being limited by us of course). Then we had the major breakthrough with the industrial revolution that gave more power to our collective elbow. Initially the power source was coal but for the last hundred years that power has been boosted by the other fossil fuels, gas and oil. And of course nuclear and to a very small degree, renewables. 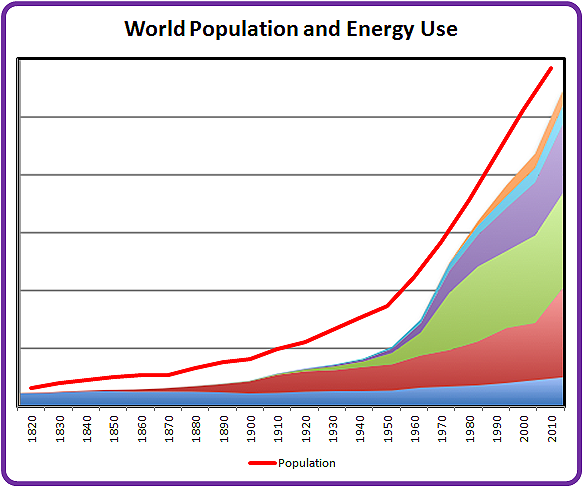 Since the human race started to tap into the one time bounty of fossil fuel our population has soared, the population growth curve follows the energy curve amazingly well suggesting that population levels and energy availability are in fact linked. This scenario is a global one rather than local. In many well educated countries where cultural and certain religious influences have been reduced the population is fairly stable, and in some the indigenous population is actually falling. It's the developing countries that show the huge population growth. But it's the developed countries that actually consume most of the energy, on a per capita basis. This may appear to show a basic flaw in the argument for a population-energy link, but if we look at food production as a global activity and realise that virtually all high yield food production is now mechanised and energy dependant and that food is shipped around the planet in huge quantities to meet market demand, I think the argument still holds. The reader might like to ponder this one, but what follows assumes the link is valid. The energy curve will however have a downturn at some time in the future and the question raised is whether the population curve will follow it down just as it followed it up. How steep the downturn and the timing of its start are matters of some debate, for example the recent boost to gas extraction using fracking techniques has caused curves that were accepted as pretty solid some 10 years ago to be pushed back 30 years or more. The gas bonanza gives oil a respite, but fossil reserves are finite, as are fission nuclear fuel reserves, and at some point all will be seriously depleted, although probably never fully exhausted - just increasingly expensive, with poorer nations being squeezed out. Renewables, and particularly solar, could of course be our salvation, using safe and proven technology. But the current trends indicate that they are not growing at anything like the level needed for them to replace fossil fuels. There are of course drawbacks with solar, wind and tidal systems as it is difficult (but not impossible) to store the energy produced and they tend not to be most plentiful where needed most. For the UK for example, with our cloudy skies and northerly latitude, solar could only ever meet about a third of current demand. A pan-european DC grid project is now underway, this will link different renewable energy sources using a new long distance electricity grid system offering much lower transmission losses and evening out the supply and demand disparities. Certainly a big step in the right direction but to make a real impact it still needs huge investment in renewable power sources, not so easy to achieve while cheap fossil energy is still around. There is of course always the possibility that a new energy technology will come on-line to take over. That technology will come to the rescue. There are various contenders here. One is nuclear fusion, the same process that drives the sun and that has provided us with our fossil fuel store, produced by decaying living matter that was fuelled by the sun hundreds of millions of years ago. A neat way of storing solar energy for some future generation, ours as it happens. Containing the heat energy released by nuclear fusion has proved to be a phenomenally difficult problem and is still very much work in progress. It is by no means certain that we will ever resolve that particular issue. Another approach to fusion power whereby energy release is controlled by using small pellets of fuel that are forced to 'fuse' by high energy laser beams may one day provide a solution, but again it's early days. Even with a breakthrough, by no means certain, we are unlikely to see a useful fusion power plant within the next 40 years or so. Incidentally, if fusion ever does come onstream it will in the long term cause very serious problems with planetary energy imbalance . A second contender for a replacement energy source is genetic engineering which hopefully will engineer living organisms, bacteria probably, that can use sunlight to produce hydrogen or some hydrocarbon fuel. Craig Ventner, founder of Synthetic Genomics, claimed about five years ago to have prototype power production plants using bacteria to produce fuel but the scale is still very small and there are problems with maintaining a suitable environment for the organisms to survive for suitably long periods of time. Again, work in progress and it's anyone's guess if it will succeed. But he's not been making any great claims of late. A third is a Hydrogen fuel economy. Hydrogen has powered airships in the 1920's and space rockets since the 1960's but is still too expensive for general use (three times the cost of petrol and a hydrogen car would cost twice as much as a petrol car). There are also issues with storage as it need to be liquefied to get the bulk down. But it's by far the most abundant element in the universe so is not in short supply, it's all a matter of technology and economics. Vast sums of money have been invested in these technologies so it's not for lack of effort that we haven't succeeded. After all, the financial rewards awaiting a success in any form of alternative are staggering. Part of the problem is that policies are dictated by what wins votes and providing the levels of heavily subsidised investment in renewables or other alternatives while fossils can still provide affordable energy does not go down well with the electorate. Communist China of course is the exception as it can plan many years ahead without having to forever look over its shoulder to the next election. (But, sadly, China has vast coal reserves, which it will continue to use for a long time yet). At the other end of the spectrum we have the USA as a prime example of a short term, dollar fixated approach, and the coming boom in fracked gas will mean that they will carry on being the planet's highest energy consumers. And there is of course always the possibility that something new, something that nobody has thought of, will pop up to save the day. Human ingenuity should certainly never be underestimated. But if a replacement for fossil fuels isn't forthcoming in the near future it's interesting to speculate on the likely scenario. 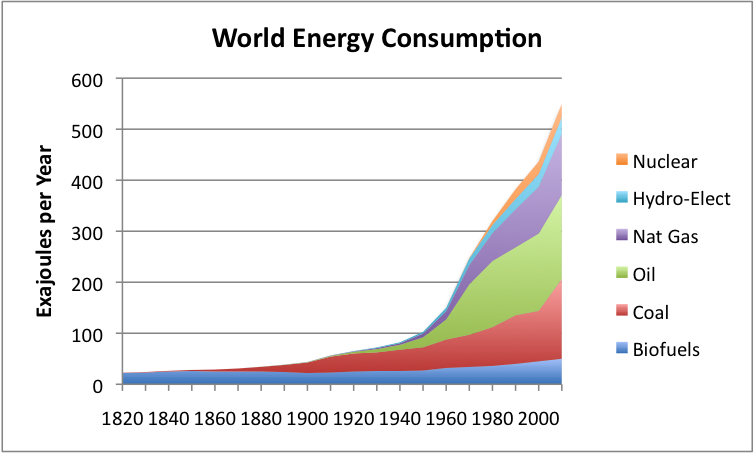 A composite curve showing the decline of various energy sources is shown below. Details of how the individual fuel projections were arrived at can be found at the end of this blog . They are of course estimates but the general trend is not in doubt, the exact timing and depth of depletion are the unknowns. To complicate matters, new fossil reserves keep being found and reserves that were deemed unprofitable will one day become profitable as energy prices rise. The expectation is that fossil fuels will be around for centuries to come. Which nations will be able to afford them is another matter. 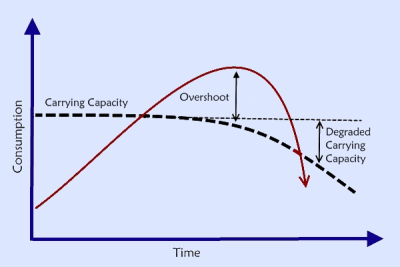 The concept of Carrying Capacity also has to be considered, this being the number of individuals in a group that can be sustained indefinitely by available resources. The proposition is that because of the energy bonanza afforded by fossil fuels we have overshot the real Carrying Capacity of the planet and have been increasing our population on the back of cheap energy. Modern food production is highly mechanised therefore highly energy dependant and getting the high yields we now need has also necessitated the use of fertilisers, the production of which also takes significant energy. The prediction then is that if an energy crash comes it will not be possible to support the present population. Instead it will fall down to the prevailing Carrying Capacity. However because of our high energy habit and high population growth rate we have significantly degraded the Carrying Capacity by pollution, global warming, water table depletion, deforestation, over-fishing, soil erosion ...... For this reason the crash, if and when it comes, will be more severe than it would have been, had we not had the bonus of fossil fuels. 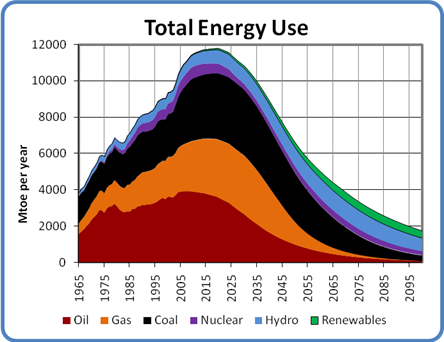 The curve below is one prediction  for population decline as a result of the energy shortfall. The timescales are of course a guesstimate but in a sense that's not the important issue, the issue is the scenario, a frighteningly rapid drop in population, partly planned as people see the writing on the wall, but also in all likelihood brought about by starvation, resource wars and disease. The benefits brought our way by the availability of fossil fuel energy could well turn out to be a mixed blessing. The longer cheap fossil fuels last the longer we will live on borrowed time and the harder will be our fall. The scenario presented in the above curves may not happen of course, but the very fact that's it's even a possibility should bring home the fact that we are playing a very dangerous game. One way to avoid this gruesome scenario is to live within our means by drastically reducing population size and voluntarily reducing energy consumption. Likely? I think not. The above blog follows on from a talk for the local U3A Science & Technology group on the link between Humankind and the Sun. (How the Sun has brought about life on Earth and how it will eventually terminate life on Earth. But in the meantime it is the only energy source we can use without causing major long term problems of planetary overheating. ) The link between energy and population was inspired by ideas from http://www.paulchefurka.com/ and the curves shown above are from Paul Chefurka's various papers (and used with permission).